“I need a word!” I cried. The internet tried its best to help. than a dismissive eye roll. Any random word would do. Bottle! Inspired by the half-empty short-necked IPA next to my keyboard. Chord! Taken from a slender reference book designed to nestle in the tall neck of a guitar case. Guillotine! I had apparently had enough of necks. Any random word—not chosen by me—would do. By dice I’d have my prompt. A dog-eared Monster Manual. 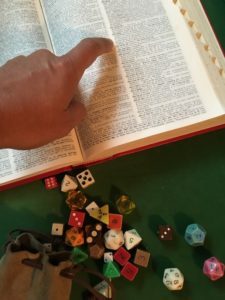 A faded Dungeon Master’s Guide. A crisp, bright dictionary… the paper kind. And the treasure I sought: a musty leather bag filled with precious jewels. By which of course I mean dice. Yanking the dictionary open, I flipped to page 405. D6: Five! The far right column. My word, the sixth down the column. where the number six bus would take her home. PS: Today’s poem prompt was provided by random chance, as described in the poem.